Brian Bauer The daily Illini Illinois’ Bobby Baker works the still rings in the meet against Minnesota at Huff Hall on Saturday. After a few rocky rotations, the No. 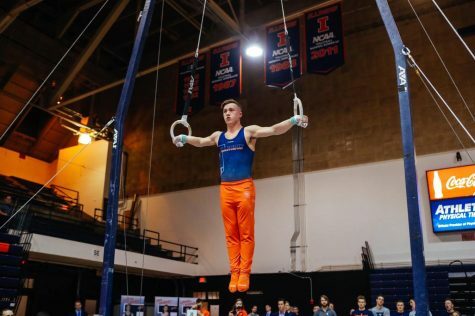 3 Illinois men’s gymnastics team beat No. 5 Minnesota 416.500 – 413.750 in its first home meet of the season. Junior Bobby Baker started off the first rotation on floor with a 14.300. Sophomore Alex Diab contributed with a 14.500, but freshman Sebastian Quiana was the star of this event, scoring a career best of 14.650, earning his first title on the floor. 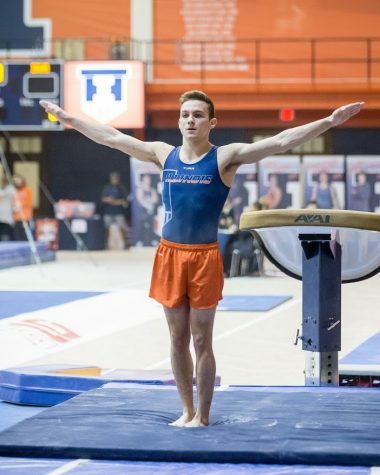 The Illini ended the first rotation with a team score of 70.700, roughly four points ahead of Minnesota, who started on pommel horse. 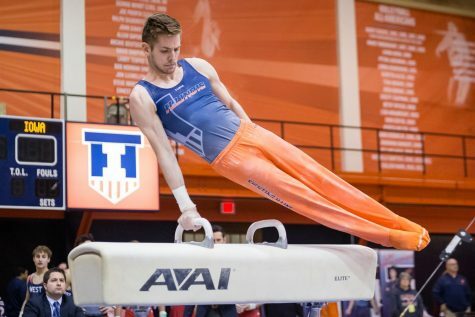 The Illini moved onto pommel horse for their second rotation. Head Coach Justin Spring said this event would be rather rough, which was an understatement. After many slips from his teammates, senior Matt Foster earned his third straight event title with a 13.950. The team finished this rotation with a 66.400. 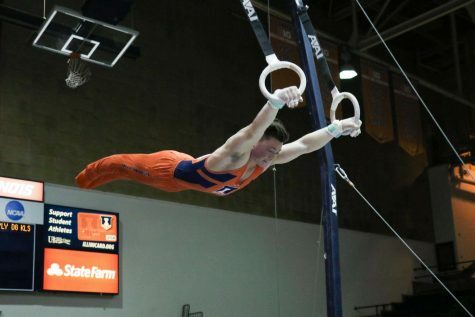 On the rings, there were three Illini who posted season-best scores. Junior Dennis Minton posted a 14.000, Baker scored a 14.200 and Diab had a 14.900 for his third-straight rings title of the season. 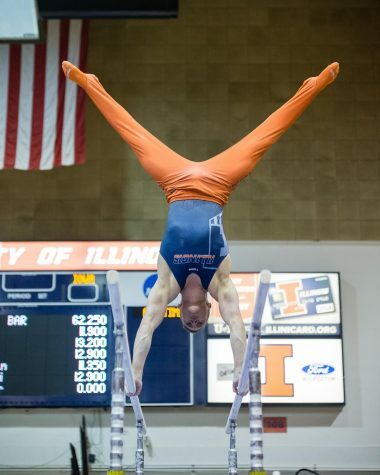 In the conclusion of the rotation, the Illini had a team score of 70.450, the best ranked score of the season so far. In the fourth rotation, Minnesota earned its first and only event title of the day on vault. However, Baker’s 14.750 score was the team’s best so far. Also with individual season-bests were Jacobson, Diab and Joey Peters. 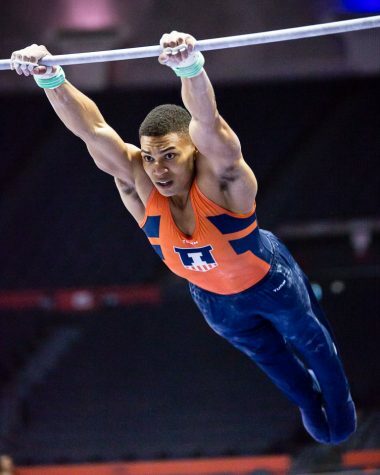 In his Illini debut on the event, Quiana helped add to the team’s score with a 13.900. 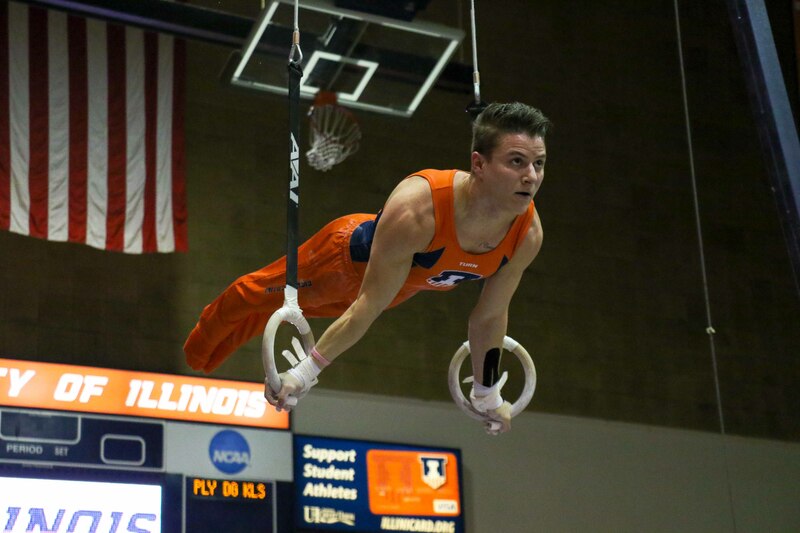 The Illini shifted to parallel bars next, where Jacobson earned his third-straight title with a 14.450. 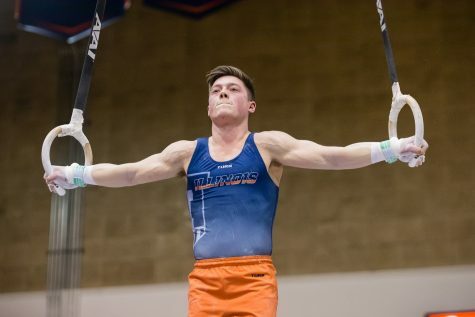 Heading into the final rotation — high bar — down by less than a point, the Illini proved why they are ranked No. 3 by the NCAA. Jacobson, Diab, junior Chandler Eggleston and junior Tyson Bull all posted season-high scores: 13.650, 14.200, 14.700 and 14.700, respectively. Eggleston and Bull tied for the title, earning their second high bar titles of the season.